Historic and modern, cultural and vibrant, steeped in tradition as well as in contemporary design. Spain’s capital is a treasure trove, waiting to be explored. In our map, we’ve included some of the best places to visit in Madrid, from museum and historical places to local markets and stores filled with good design. Browse through the list to discover all of the exciting and fun things to do in Madrid to make your trip extra special. Whether you’re new to Basque cuisine or a connoisseur, the family-run Arima Basque Gastronomy is a great choice for lunch or dinner. This cozy and warm restaurant offers a peaceful retreat from the busy streets of Madrid. Once seated, you’ll have the opportunity to enjoy some delicious tapas and traditional dishes made with fresh, local ingredients. Wash it all down with some wine, Basque beer, or a glass of one the most popular items on Arima’s drinks menu, vermouth. Hip and cool, Toma Café looks like it could rival coffee shops in NYC with its quirky décor that includes bicycles and exposed brick walls. Don’t be fooled, though. Here, specialty coffee is the main attraction and star of the show. Many locals consider this place one of the best in Madrid to get an espresso or a café con leche done right, so make sure you drop by while you visit the city. Café Central Madrid is unlike any other coffee shop. For over 35 years, this iconic space has housed live music concerts that focus on jazz, making its way on various ‘best jazz clubs’ lists. The emblematic café and bar is a destination in of itself, and a must-visit place for music lovers. Lolina Vintage Café welcomes its customers in a charming retro décor with bright colors and items that reference the ‘50s, ‘60s, and ‘70s. The coffee shop is open all day, so you can drop by for breakfast, brunch, lunch, or even dinner. The menu includes everything from amazing coffee to sweet and savory delicacies and cocktails, as well as tea and infusions brought all the way from California. Stepping inside Café Manuela, customers discover a traditional, old-school interior that combines familiarity with a welcoming atmosphere. The vintage décor includes artworks, columns, art nouveau details, and traditional wooden chairs. On the menu, coffee and cocktails appear alongside milkshakes and ice cream. To make get-togethers with friends even more fun, a large selection of board games is also provided. Mür Café offers a complete menu which features the expected coffee and pastries as well as cakes, savory options and cocktails. The coffee shop also serves a fantastic brunch on Fridays and weekends, but keep in mind that for the latter you’ll need a reservation. Leather sofas and upholstered armchairs provide extra comfort, while a fireplace takes the level of warmth and coziness to a whole new level. Federal Café is a perfect place to go to if you love eating good food and want to enjoy some great coffee in a laid-back atmosphere. This coffee shop is popular with the locals and tourists alike and it’s not hard to see why. Chic décor and airy interior? Check! Organic ingredients and local recipes? Check! Delicious iced coffee on hot summer days? Check! Oh, and you can also sit at a table in the gorgeous outside area. Stepping inside Do Design is like walking into a well-designed, airy apartment. The interior features pine floors, exposed brick walls, quirky details, and plants scattered throughout the bright space. The clean, Nordic-inspired design of the shop also defines the products, which include anything from jewelry and accessories to home décor and tableware. Located in a renovated old chapel that dates back to the 18th century, La Central features a blend of charming architectural details. Baroque arches appear alongside ultra-modern and minimalist furniture, while the children’s section features a painted ceiling. The bookshop has a fantastic selection of titles, as well as a popular cafe and rooftop restaurant, if you feel like taking a break from shopping. The former ‘not so humble’ home of the Marquis of Cerralbo, who spent his life amassing an impressive collection of works of art, this building was donated to the Spanish state to become what is now known as Museo Cerralbo. Upon entering, visitors discover an array of gems that range from art and architecture to vintage furniture, photography, and tapestries, to name just a few. You probably should have CaixaForum Madrid on your list simply because of its architecture. The building was renovated by the Herzog & De Meuron architecture practice and looks striking alongside its vertical garden. Inside, you’ll stumble upon modern and contemporary art as well as on cultural and educational events. Used as a slaughterhouse in the 20th century, Matadero completely transformed to currently house a huge variety of cultural events. In this contemporary space you might see, in one day, a design show, a play, a documentary, a sculpture exhibition, or a bicycle mechanics workshop. The program changes constantly, so it’s safe to say that you’ll find something exciting to see on your visit. Visit Museo Lázaro Galdiano to see some of the works of art, decorative pieces, numismatics, jewelry, and more collected over the years by banker and publisher José Lázaro Galdiano. The collection covers a long period, starting from prehistoric times and going all the way to the 19th century. A treasure trove for art lovers, Museo Thyssen-Bornemisza provides access to an incredible collection put together by collector Heinrich Thyssen-Bornemisza and his wife Carmen. The eclectic range of artworks includes Dutch paintings from the 16th century and Gothic works alongside Impressionist and Modern American art. Centro de Arte Reina Sofía is Spain’s 20th century art museum. It houses artworks from Spanish giants such as Picasso (yes, you can see Guernica here), Dalí, or Miró, and international artists that include Francis Bacon, Georges Braque, Mark Rothko, Damien Hirst, or Gabriel Orozco. And if you’re still hungry formore art, you can also drop by Palacio de Cristal and Palacio de Velázquez to see their current exhibitions. Museo ABC is located in an 1891 beer factory which was renovated to accommodate the art center. This museum of illustration features both contemporary artists and early 20th century illustrators, with works covering everything from 1920s fashion illustration to modern book illustrations. Before you leave, you can also drop by the museum’s bookstore to find some hidden gems. Opened in 2013 in Madrid’s cultural center, La Fabrica is a concept store that brings together a large exhibition space, a well-stocked book shop, and a coffee shop under one roof. Which means that after you’ve found the perfect book to take back home and admired the artworks, you can also enjoy a cup of good coffee and a bite to eat. At Angel Sierra, you can find some of the best vermouth in Madrid and enjoy it with some tapas in a friendly, old-time atmosphere. The bar is full of character and looks even older than its 100 years. Loved by locals and tourists alike, this popular bar is the kind of place that becomes one’s favorite. A vintage-style Hawaiian décor, pin-up illustrations, rock ‘n’ roll music, and vibrant colors bring El Fabuloso Coconut Bar customers back to the 1950s. This quirky and fun bar serves amazing cocktails as well as milkshakes and fruit smoothies. A great choice if you want to go for drinks with friends. The Hat aims to provide the perfect travel experience by combining the convenience of a hostel with the services of a hotel. 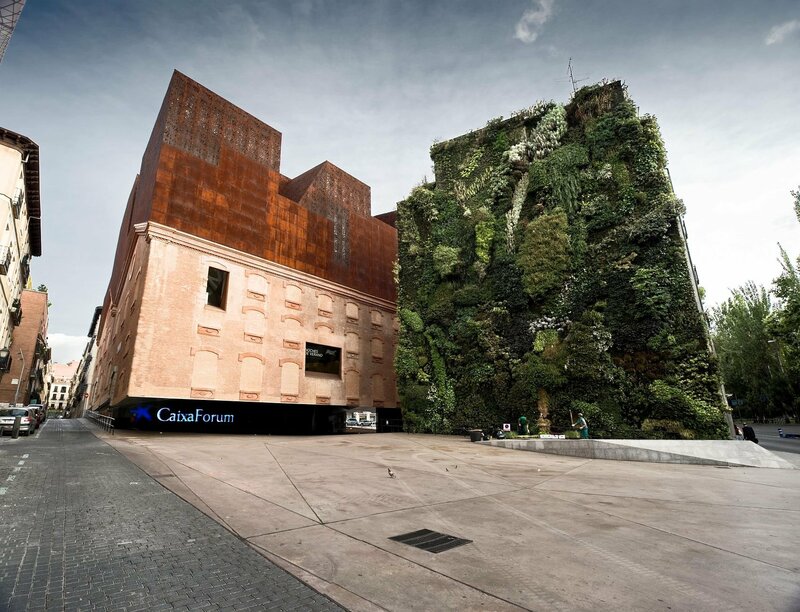 Eco-friendly and modern, this hostel has an efficient energy and water consumption system and it’s also the first in Madrid to use biomass as an energy source. The rooms have the latest technology, including Smart TVs, tablets, and free dual WiFi. Guests can also enjoy their breakfast on the terrace or drink a glass of wine at the rooftop bar while watching the sunset. The Principal boutique hotel is not only located in the heart of Madrid, but it also offers a complete travel experience. You could easily spend two days here without even getting out of he hotel. 76 rooms, a haute cuisine restaurant, one bar that serves cocktails created by Ramón Freixa (who has 2 Michelin stars), a rooftop terrace with panoramic views, and a solarium. Oh, and there’s also a Wellness Suite with a private sauna. Walking through the front door of Panic, bread lovers and foodies might become just a bit overwhelmed by the scent of freshly baked bread. Made with minimal ingredients but with an incredible amount of passion, the Panic bread is available in just a few varieties – all baked to perfection. You’ll also find delicious cakes and the occasional sandwiches here, and maybe even stumble upon a bread-making workshop. Part of the Museum of Romanticism, this charming coffee shop and tea salon welcomes customers into a romantic setting that reminds of the 18th century. Apart from its delicious home-baked cakes, pastries, and aromatic coffee or tea, Café del Jardin del Museo del Romanticismo also offers access to a gorgeous garden with lush vegetation and a fountain. Originally built in 1916, Mercado de San Miguel has transformed into the most popular food market among tourists who visit Madrid. The iron and glass building underwent a long renovation process, opening its doors to customers in 2009. Since then, it has attracted foodies looking to buy fresh produce, delicacies, tapas, and many, many other sweet and savory treats. Quesería Cultivo offers an amazing range of artisan cheese sourced not only from all over Spain, but also from countries like Italy, France, or Holland, to name a few. Inside, you’ll discover an array of cheeses to choose from, with friendly staff always ready to give you a helping hand. The shop also sells butter and wine – all you’ll need is fresh bread to make a picnic out of it! Fan of offal or want to take the plunge and give it a try? Then you have to put La Tasquería at the top of your list while visiting Madrid. Opened by Javi Estévez, a former Top Chef contestant, this restaurant takes the traditional and humble offal recipes and gives them a fresh, modern twist, all in gorgeously plated dishes you’ll probably put on Instagram. Located in the Retiro neighborhood, Laredo is a great choice if you want to get a taste of authentic Spanish food in a friendly atmosphere. Like many other Spanish restaurants, here you can order some mouth-watering tapas on the lower level or head up to the first floor for a full and hearty meal finished with a bottle of fine wine. Arzábal opened in 2009, serving simple and beautifully made traditional Spanish food and tapas along with great wine. The restaurant quickly gained notoriety, leading the two founders to open a second, larger location. At both restaurants, each meal starts with fresh bread and French butter – a tasty intro to excellent food. Sala de Despiece celebrates food, ingredients, and gastronomy in a creative way. The restaurant features a white décor inspired by butchers’ and fishmongers’ work tables, with plastic boxes used to transport produce appearing on the ceiling and walls. Locally sourced seafood and seasonal dishes are also completed in front of the customers, for a special touch of authenticity. You can just drop in, as the restaurant doesn’t take reservations. Just make sure you’re there early. A family-run restaurant, Sacha was opened in 1972 by a couple who named it after their son. Sacha Hormaechea took over the reigns after finishing culinary school, bringing a modern touch to the traditional, bistro-style menu. Apart from its fixed Spanish menu with Galician influences, the popular restaurant also offers dishes that change with the seasons.